This way! A laughing woman tourist holding a map is smiling and pointing towards the Venice Square monument. Behind her, the Venice Square lawns and gardens. Rome in two days, we have planned guided tours of Rome to cover the main attractions in two days, special itinerary including the the Vatican City, private tour and skip the line reservations!!! MUSEUMS PRIVILEGED ENTRANCE. NO WAITING IN LINE! A complete private guided tour of Rome city lasting 2 days to see the main attractions of Rome, Coliseum, Catacombs, Roman Forum, Moses of Michelangelo, Vatican Museums, Saint Peter’s Basilica and Sistine Chapel, and all special sites of Rome. 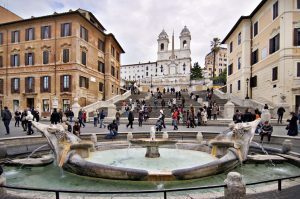 Visit Rome in two days – Colosseum, Roman Forum, Vatican museum, Sistine Chapel, Coliseum, in 2 days, Rome escorted tour in English, Russian, Spanish, French,..
Visit Rome in two days – Colosseum, Roman Forum, Vatican museum, Sistine Chapel, Coliseum, in 2 days, Rome escorted tour in English, Russian, Spanish, French,..
Visit the Vatican City, enclosing the world’s richest art collection, to discover the highlights of the Museums, including Raphael’s Rooms, the ancient Greek and Roman sculptures, the Renaissance Tapestries, the Gallery of Maps with views of the Vatican Gardens, the Sistine Chapel home to Michelangelo’s awesome frescoes and Last Judgment. Enjoy anecdotes and accounts of famous artists and popes giving you a fuller understanding and appreciation of the renaissance spirit which heralded great changes in thoughts, art, architecture, music and human conditions. Then see the immense Basilica and Square of St. Peter to marvel at its overwhelming Dome and structure, the sublime and touching “Pietà” of Michelangelo, Bernini’s glorious and mystical baroque Canopy, and the burial-site of St. Peter with the monumental tombs of Popes. Hear about the Papal Swiss Guards and the making of Vatican City State through the centuries. End of morning tour. Stroll at sunset through a maze of fascinating medieval streets and narrow alleys accompanied by intriguing stories and legends recounted by our friendly guides to discover Rome, in the cool and away from the usual tourist itineraries to capture the unforgettable sensual atmospheres of charming squares like Spanish Steps, Piazza Navona and Santa Maria della Pace, romantic and mysterious. Magical sensations produced by splashes of the Trevi Fountain, the lazy and silent flow of the Tiber river and the elongated shadows cast on cobblestones by the Pantheon’s unique Dome will reveal the bewitching air of the Eternal City as we visit hidden renaissance and baroque treasures. Our promenade will continue to Emperor Hadrian’s Mausoleum and legendary St. Angel’s Bridge to enjoy a fantastic sight of the Pope’s imposing Castle-Fortress and to enjoy an insuperable view of St. Peter’s Basilica and its Colonnaded Square elegantly illuminated. Your guide will be delighted to pass-on good suggestions on restaurants, wine-bars and other Rome city travel useful information. Enter the impressive symbol of Rome city , the Coliseum and hear vivid details of the ferocious gladiator combats, wild animal hunting scenes and the many varied spectacular events held there. Visit the Palatine Hill and see breathtaking views of Emperors’ residences. 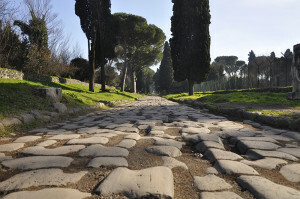 Stroll along the “Via Sacra” just as Julius Caesar, Caesar Augustus and Hadrian did when they paraded their victorious legions to the Roman Forum, centre of political, religious and commercial life in ancient Rome. See the interior of the old Senate, Temple of Vesta, dwellings of the Vestal Virgins and Triumphal Arches of Titus and Septimius Severus. Our storyteller guides will bring history alive describing the architecture, superstitions, traditions and myths of the sprawling roman populace and the incredible extravagancies of the imperial court when the city was capital of an unrivalled empire. Our exploration will lead us up to Capitoline Hill to observe the suggestive and evocative ruins of the millenarian Latin civilization and then to discover the Michelangelo-designed elegant renaissance square with its bronze statue of Emperor Marcus Aurelius. End the morning tour perhaps relaxing and enjoying one of the most beautiful panoramic views of Rome from the “Caffarelli” terraced-café. After time for lunch continue your afternoon program in either limousine, minivan or by electric car. Stop to explore the mysterious Catacombs situated along the old Appian Way, totaling some 150 kilometers of underground tunnels and galleries used as cemeteries by early Christians under roman persecutions. See the tracks of the vast Circus Maximus where 180 thousand inflamed spectators could fervently incite their favorite heroes to victory and view the sprawling Emperors’ Palaces on Palatine Hill. Courageously dare placing your hand in the oldest “lie detector” in the world, the famous “Mouth of Truth” and then continue your walk to admire the well-preserved Temples of Hercules and of Portunus situated on the banks of the Tiber. Discover the most recent archaeological excavation-site in Rome city to visit the Portico D’Ottavia, Theatre of Marcellus and the nearby old Jewish Ghetto of Rome . Conclude your tour at the authentic spot of Julius Caesar’s assassination on the Ides of March, 44 B.C. and now refuge to thousands of street-cats. Return to your hotel and end of tour. Apart from English and Italian We are able to offer tours of Rome city in a wide range of languages Spanish, German, Norwegian, Finnish, Swedish, Arabic, Polish, Russian, French, Dutch, should you wish to book a tour in a specific language, please follow the relevant link below. 7 hours a day, for 2 days. Total 14 hours. We are able to offer Rome in two days tour in a wide range of languages, should you wish to book a tour in a specific language (apart from English and Italian) please fill the form below. Tour of Rome in two days available everyday. Rome in two days Tour – Rates per person include the above walking/driven tours plus air-conditioned Limousine, minivan or other means of transport, personal tour guide, driver. Admission fees to the monuments are not included in the rates. Rome in two days tour available only in limousine or minivan or other means of transport. 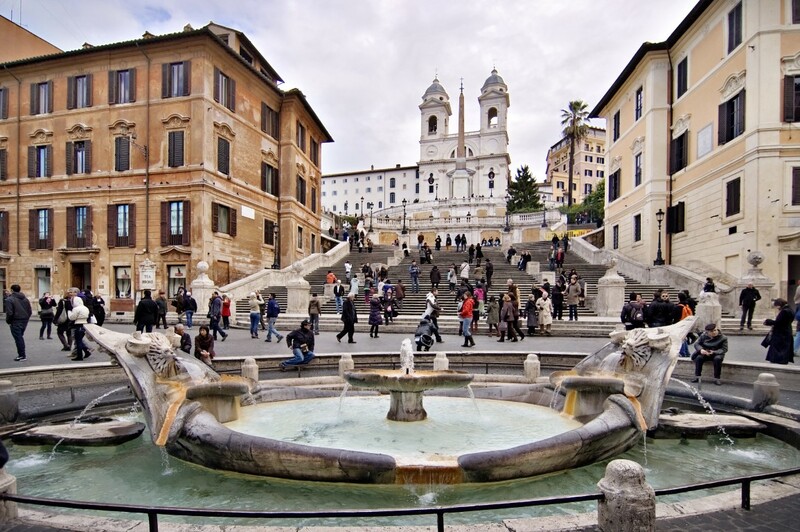 Rome in two days tour suitable for children, for disables if with wheelchair on request.